For a long time land of orcs and land of goblins was divided by magma river. Your king are collecting armies and going to conquer a rich neighbour. He needs a reliable way to quickly cross the flow with all his hordes. Help him to start a war! Or do something else. I finished game 8 hours before deadline. There was some troubles with pyinstaller but I googled workaround. I not finished game yet. I have no start menu, no sound, no winning condition, do dead condition. But magic works! I have several levels. It looks cool! Today I need to finish alpha version. Day 3 - need more code. - If you can play https://quickdraw.withgoogle.com/ then you can draw a good sprite set for pyweek. - Tiled Map Editor is very useful. It has good file format for tiles and maps. I do not need to write map editor. I'm afraid using it a lot is kind of cheating. It is Tiledweek, not pyweek. 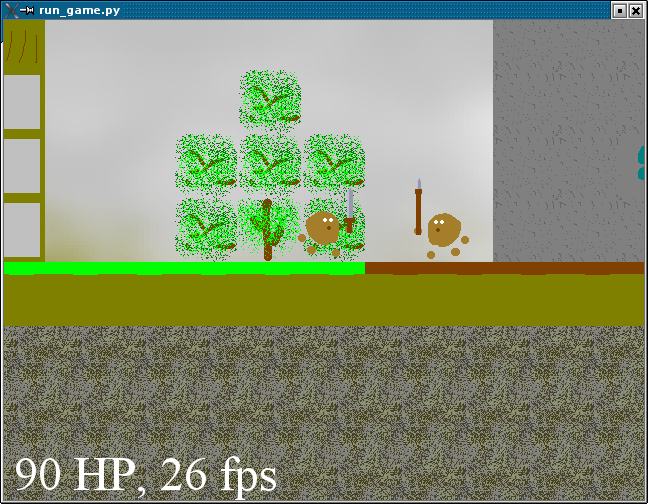 - I added many tiles and frame rate drops to 30 FPS. I'm using pyglet, kolourpaint, GIMP, Tiled Map Editor, QtCreator with pyqtc and 10 years old notebook. Surprisingly I can't fill 640x480 screen with dynamic tiles keeping 60 FPS. Even manually with OpenGL. My CPU and GPU are fast enough. Bottleneck is in link between them. I do not intent to change (crash, burn and destroy) map content during gameplay. So placing entire map in one Batch is ok.
My drawings is awful. I can't draw orc or goblin. I tried to draw a wall. Unsuccessful. There will be blobs and circles in place of monsters. My code is even worse. Day 1 - What should I do? I like the theme but I really don't know what to do. Can make start menu. Game should be Fun and Innovative. I am comfortable with 3d-shooters and 2d-scrollers. I don't want to make any kind puzzles. It is possible to use 3 worlds if I start with "Look! We discovered two new worlds!" I need to make decision as soon as possible and be Innovative. What the differene between worlds can be? Maybe I should make a list of world pairs then make a random choice. - BigEndian/LittleEndian, tabs/spaces, vim/emacs, functional/imperative. War of robots than can't understand each other because of endianness. Ended by 8-bit microcontroller. - ORCS vs GOBLINS!!! And TROLLS too!!! I do not want to make a random choise now. It will be side-scroller about war between world of orcs and world of goblins. Worlds will be very similar as you can guess. Short name for entry is fixed. And now I got a half of pyweek 25 theme. My game should be about short names if I want to have meaningful URLs.